This is a card I made for my little granddaughter, Jade, some time ago. Even though I couldn’t get things on my blog, I could still make cards! This was an experiment in using paper from one paper pack rather than a number of different paper sources to simplify my process. After all, the designers make all the papers in one pack to coordinate with one another so why strain my brain if I don’t have to? 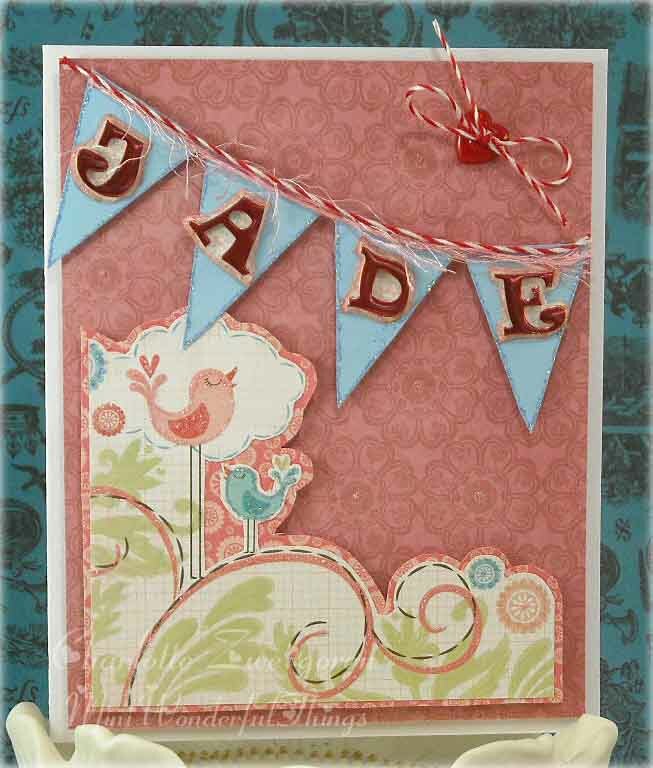 Banners are very popular right now and I loved the shiny, wonky letters spelling out Jade’s name. I’m sure she loved it, too! In fact, I think she has taken a greater interest in learning to read so that she can read the cards I send to her. What a cool bonus! This entry was posted in art, card, papercraft and tagged bright colors, child's card, name banner. Bookmark the permalink. Love the letters and love the color combination!!! miss talking to you Charlotte!!! I love this one….bet Jade does, also.